Just as honey is one of nature's truly miraculous substances, so is its fermented product: mead. This golden libation of the Norse gods is an alcoholic blend of pure honey and water, that hold flavors ranging from desert-dry to dessert-sweet. The basic recipe for mead is simply honey, water, and yeast. Literally three basic ingredients required to craft this libation together. Often various fruits, herbs and spices are added to produce a dry, sweet or even sparkling mead. The sky is the limit when experimenting as a home brewer.. let the wild flavor combos ensue! We've came up with two delicious & hearty brews ourselves: Nettle, Cherry & Lemon Peel for the first batch. Apricot, Crystalized Ginger & Vanilla for the second. First let's review some tips n ticks on ingredients, equipment, and techniques you'll need to get your own brews made. Honey is the first ingredient to consider when making mead. 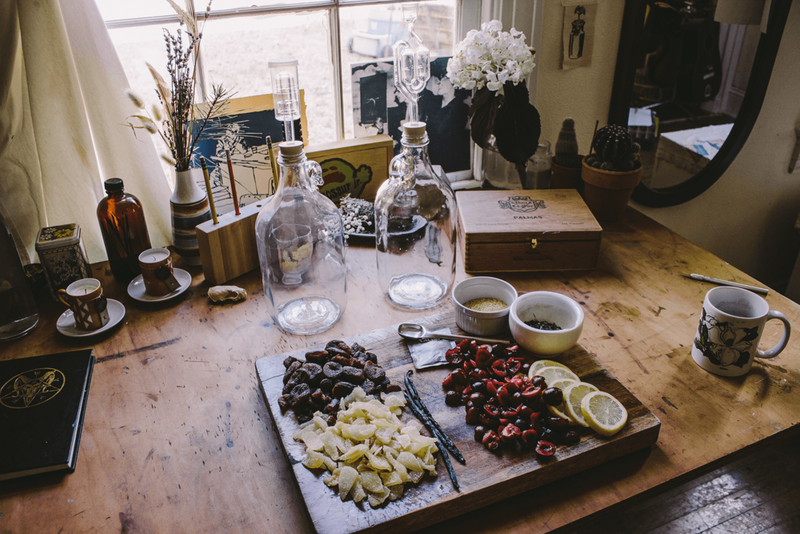 Being so, choosing a more or less sweet variety of honey can greatly impact the outcome of your mead's taste. A simple rule of thumb for the quality of honey, is the darker the honey the higher the sugar content, also the pollen source. Honey from wild flowers and clover tends to be lighter and has a lower sugar content while honey from fruit trees and grains tends to be darker and sweeter. 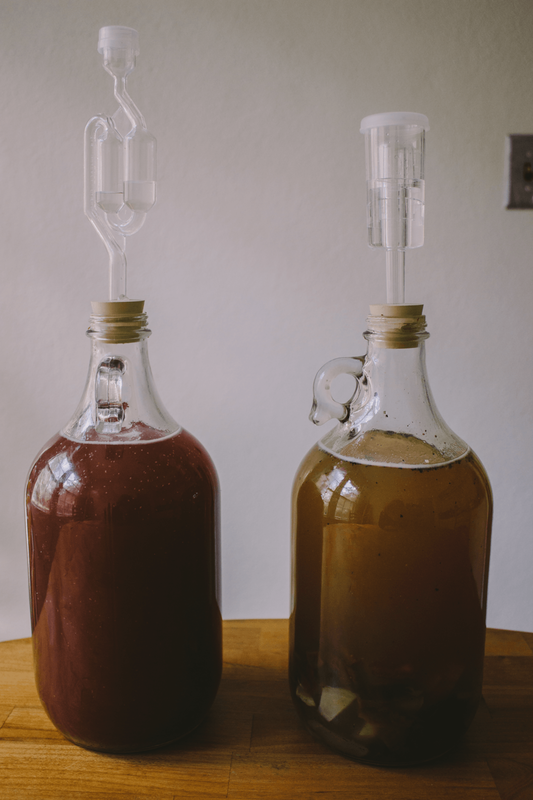 Yeast nutrients are not essential but they can be very beneficial to your mead. Yeast are single-celled living organisms that metabolizes the sugars in honey to carbon dioxide and ethyl alcohol. 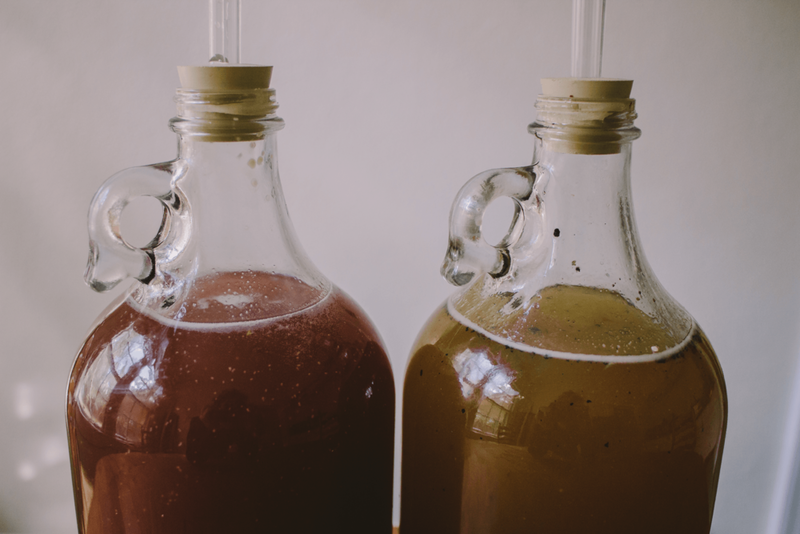 Selecting the yeast is just as important as your other ingredients while it controls the alcohol, sweetness, flavor, and even color of the mead. We chose a cultured and well-suited to fruit, wine yeast, Lalvin K1-V1116 Saccharomyces cervisea, courtesy of Homebrew Den. To create the fruit-containing mead, add ten to twenty percent fruit juice, whole dried/fresh fruit or purees to your honey-water mixture. Almost any spice or herb can also be added to mead, either as an extract or directly at almost any time during the mead making process. Blends of two or more spices and herbs are commonly used. If added directly, they should not remain in the mix for very long because bitter components may be extracted. Oh and I'd definitely avoid city water since it has some chemicals in it. Not to say it won't be good, but if you can get a good, clean water source, use it. Start by learning about sanitation. We've come a long way since those early days of wild yeasts and bacteria so it's a big first step towards a successful brew. If you want to avoid spoiling your mead (or getting a disease) you should sanitize all your brewing materials thoroughly. Contamination causes offish flavors, poor stability, aesthetic problems. Bottom line - it can totally ruin yr mead. As for required equipment, you should acquire a gallon container, a rubber stopper and some sort of airlock. Homebrew Den also helped us out in that department. We used two half gallon glass jugs, but as an alternative you can brew in just a clean milk jug with a balloon on top *for the real DIYers. Along with our sweeter fruit ingredients, we used a more bitter herb to really enhance its flavor. Stinging nettle, rarely thought of as an herbal remedy, but really its healing properties are overwhelmingly abundant and have been documented for hundreds of years. This nutrition packed herb is traditionally known as a “spring tonic”, being one of the earliest greens to bloom in spring. Stinging nettle has shown to be an asitingent, diuretic, heretic, anti-allerginic, antihistamine, and so so much more. The plant’s leaves may be used dried or fresh - its most common form being nettle tea. Nettle is slow to metabolize and thus gently moves through the body, making it extremely beneficial to the kidneys as blood and intestinal purifier. Its significant ability to purify the blood also relies on its high content of vitamin A, C, K, and iron. Cool fact = dried nettles are nearly 40% protein! The leaves can also be used externally, as treatment to skin irritation like mouth infections, eczema, acne, and insect bites. Nettle is a great healing alternative to women experiencing PSM or menopause, and historically has been used to help lactating women increase the flow of their breast milk. In a month or so, nettle will be in abundance! And its exciting to think of all its potential just available in your own backyard. Be sure to check out this site on the proper procedures when harvesting and preparing nettle. We just used dried nettle in our mead, cooked down over the stove with the other cherry and lemon peel ingredients. The nettle actually acts as a yeast "energizer" in a mead from the tannic acids. This helps speed up the fermentation process. 1. Place all ingredients except honey and yeast in a large stock pot. Bring slowly to a boil and then let steep. Depending on your ingredients you can choose to strain your mixture or not. We strained the Nettle wine because a lot of the flavor and medicinal value came out in the boiling process. Plus leaving the tea would leave a more bitter taste. The dried apricot, ginger & vanilla bean wine will continue to flavor the mead over a month's time so those ingredients will be left submerged in the wine until it is ready. After straining, measure out one part honey to three parts of your hot off the stove liquid in your fermentation vessel. Shake up the mixture until honey is dissolved. 2. 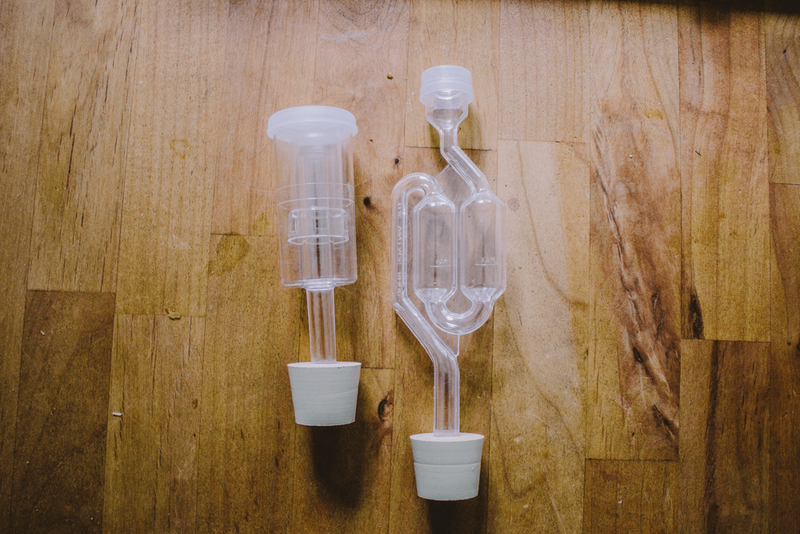 When the mixture is cooled to lukewarm, add yeast and top with a rubber stopper and airlock (this allows your fermentation pressure to escape). Let your concoction bubble away! 4. Now it's all about the waiting game. Store for at least 6 months in a cool, dark place. The mead will continue to mellow, and will taste better the longer you can stand to wait. Oh, and don't shake your finished mead bottles! The sediment is yeast and is best left to work its magic alone.